The iPhone’s lack of expandable storage How to Create Your Own Expandable Memory for Your iPhone, iPad, or iPod Touch How to Create Your Own Expandable Memory for Your iPhone, iPad, or iPod Touch Read More has always been a sore point. The memory in the device when it’s purchased is all it will ever have. Need more? Buy a new iPhone. Apple has increased the storage available throughout the years, but that’s a losing battle. High-speed mobile Internet connections, combined with 3D games and HD video, make even the 64GB model easy to fill. Most iPhone users will eventually face iPhone storage space limitations. Fortunately, there are ways to work around them. When you plug your iPhone into your computer, you have the option to sync music, movies and other media How To Sync iTunes Library With Your Music Folders How To Sync iTunes Library With Your Music Folders Read More . If you’re like most users, you turned these features on when you purchased your iPhone. And now your media is eating your storage. Open up iTunes and open your iPhone’s sync options. At the bottom there will be an option to “Sync only checked songs and video” with a box next to it. Check it. Now go to the Music tab. Click the “Selected playlists, artists, albums, and genres” radio button and un-check the three option boxes below if they are already checked. Now go through your library and check off only the music that you absolutely must have on your device. Next move on to the Movies, TV Shows and Podcasts tabs (in any order you choose.) At the top of each tab there will be a checkbox next to “Automatically include” along with drop-down menus that let you fill in the options. You can use these to reduce data consumption. For example, I listen to numerous podcasts, but I tend to listen only to the latest episode and can simply download later episodes if I do decide I need them. Because of this, I can change my “automatically include” options so that only the most recent episode of each podcast is automatically synced. Doing this saves about three gigabytes of data on my device (I listen to a lot of podcasts!) You’ll see even larger savings if you use the same settings with Movies and TV Shows. A single HD movie can take up several gigabytes of data. One word of warning, however – if you try to download an HD video that is no longer synced while on the go you could exceed your monthly data allowance within just a few hours. Both of these options trade media quality in exchange for additional iPhone storage space. Using only standard definition video will let you pack in two or three times as many videos in the same memory at the expensive of sharpness. 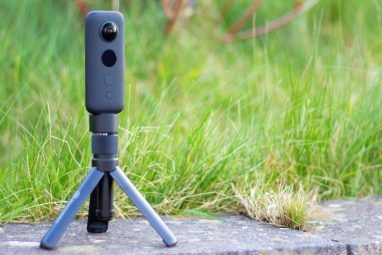 Videos will appear blurred and fine details will be hard to make out. Converting songs to a lower bitrate will result in a less dramatic improvement, but you’ll still be able to cram in a few more songs. Most users will struggle to notice the reduction in quality, as well. The basic bundled earbuds packed with the iPhone aren’t good enough to make a lower bitrate stand out. If you’ve used the options above, yet are still having trouble keeping your data in check (or you simply can’t stand losing access to all your music) it’s time to check out iTunes Match. This service automatically makes music that you have in your library at home available on any other Apple device with access to iCloud. It does this by streaming music from Apple’s servers. Most of your collection doesn’t even need to be uploaded – if the music is on iTunes, Apple merely needs to verify you own it. The benefit is obvious. If you can stream music using mobile data your collection doesn’t need to be on your iPhone, freeing up your iPhone storage space. Downsides? It’s $25 a year. If you listen to a lot of music on the go (a few hours per day or more) you may chew through your bandwidth cap Saving Mobile Data: 5 Clever Ways To Reduce Data Usage Saving Mobile Data: 5 Clever Ways To Reduce Data Usage If you’re on a limited mobile data plan, you may find opening your bill to be harrowing experience. Is there an overage charge? How much? And why was there so much data used? While the... Read More . Your music won’t be available if you don’t have a data connection. And streaming music eats more battery than playing it from your iPhone’s memory. Alternatives include Amazon Cloud Player and Google Music. The latter is free, and while it has no official app, there is unofficial support from apps like GoMusic. 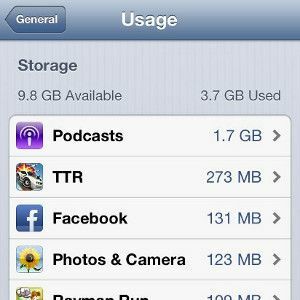 All of the tips listed so far, if implemented, should decrease the storage used on your iPhone by a significant amount. Still, you may find yourself low on storage if your woes are completely unrelated to media. Most apps are small in size but a few, like games, can take up a lot of space. Open Settings->General->Usage on your iPhone. You’ll see a list like the one below. This will tell you what specific apps are taking up data on your device. You can then tap on an app to open more detailed information and then tap the big, red Delete App button to get rid of it. Remember, deleting an app will also delete all the data contained in it, so be careful. You’ll lose any save information that hasn’t been backed up. Dealing with limited iPhone storage space isn’t easy. Often, you find yourself making a compromise between data on your device and data streamed from the cloud. With many carriers now switching to limited monthly data even streaming isn’t a guaranteed solution. Still, the tips listed here can save a lot of data. Implementing them all could move tens of gigabytes of off your iPhone. Do you have a tip that I missed? Feel free to post it in the comments. What about using the iCloud storage? iCloud storage syncing and song playback eats up your data plan. Not an issue for those with hefty ones but can easily max out 1 or 2 GB plans. To gain space... sync less files and apps. OK Thanks. Needed some extra space on iPhone and this has cleared me a fair few gigs!